Enjoy a private New York night tour, seeing and photographing beautifully lit sights around the city and taking in one of the world's most famous skyline from across the rivers in Brooklyn and New Jersey. This is a 3-hour tour and transportation is provided in a 2015 Toyota Sienna mini-van with the capacity to accommodate up to 6 guests. This is fantastic and memorable way to spend an evening in New York! At nightfall or later if you prefer, you will be met for your 3-hour tour at the Manhattan location of your choice. Take a drive in your private vehicle to Hamilton Park in Weehawkin, New Jersey, high up on the cliffs overlooking the Hudson River. 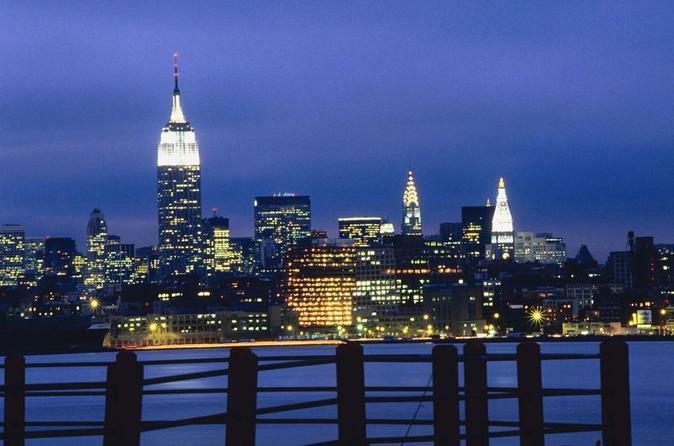 There, you will enjoy what is considered to be the best night view of the New York City skyline. From Weehawkin, travel along the Hudson River for various river-level views and photos of the city. Through the Holland tunnel, across lower-Manhattan and over the Brooklyn Bridge, you will visit DUMBO, Brooklyn Bridge Park and the Brooklyn Promenade for stunning river-level and high ground views and photos of the Brooklyn, Manhattan and Williamsburg Bridges, as well as the city skyline from the southeast. More iconic New York sights can be seen from here than any other location in the city. Then cross the Manhattan bridge for magnificent views of both uptown and downtown. On the way back uptown, you will have the opportunity for close up views & photos of such New York icons at night as the Empire State Building, Washington Square Arch and more. At the end of the tour, you will be dropped at the Manhattan location of your choice.